Ask any tanker mate what the #1 nightmare of sailing is. And they’ll probably tell you it is to be in the center of oil pollution inquiry. That’s a nightmare: to be in that position, facing oil pollution inquiry. And yes, it makes sense as the consequences of such inquiry can be severe. But you know what !! If you are not at fault, chances are that you will escape spot free. But there is something you can never escape spot free. And that is incorrect oil record book entries. The severity of the consequences may vary. For example if there is deliberate attempt to make a wrong entry in oil record book, the consequence would be severe. And if there are some typo or calculation errors, the consequences could range to some monetory fines. But wrong oil record book entries will never go spot free. And there is a reason for that. If you made some wrong oil record book entries, you alone are at fault. No one forced you to make such entry. Oil pollution can be an incident but not wrong oil record book entries. That makes it so much important to make absolute correct entries in the oil record book. But to be able to do that, there are two things you must possess. More often than not, you can fathom the seriousness by merely having a look at few pages of the oil record book. 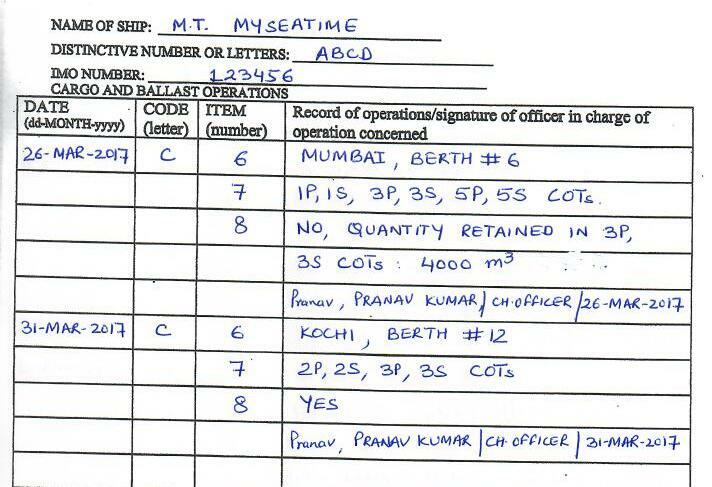 If the handwriting is shabby and alphabets are flying around, seriousness is not shown in making these entries. And believe me when I say that poor handwriting has nothing to do with it. I have seen mates with poor handwriting making the entries in capital letters to compensate for their poor handwriting. But even if you are super serious about it, you still need knowledge of “how to make oil record book entries correctly”. There is Intertanko guide on this but there are many grey areas left unanswered in this guide too. 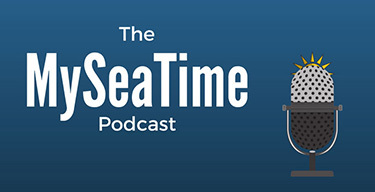 First the guide is not comprehensive and second there isn’t explanation of many doubts that seafarers usually have while filling up the oil record book. In this post, I will try to plug all these gaps by going through all the practical situations we face during oil tanker cargo operations. There should absolutely be no confusion for A-1: Place of loading. But when writing the place of loading, not only write the port but also the berth number or the accurate location inside the port. A-2: Type of oil loaded and identity of tank(s) is also not confusing. This is where all the confusion and wrong entries exist. First point to consider is that all the quantities in A-3 need to be in m3 at 15 C.
While I personally do not agree with this. For example read what MARPOL require for A-3 to be written as. A3: Total quantity of oil loaded (State quantity added in m3 at 15 C and total content of tanks in m3). 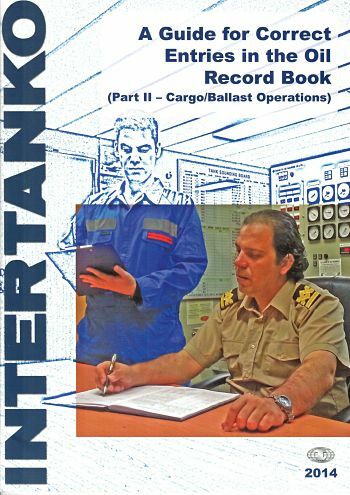 It does not ask the total content of tank to be in 15 C. But in the Intertanko book, under example for “loading of cargo entry” it gives the total content at 15 C.
To avoid any misunderstanding, I therefore recommend to write both the quantities at 15 C.
Now let us consider few of the conditions. But there are few errors that we make frequently. 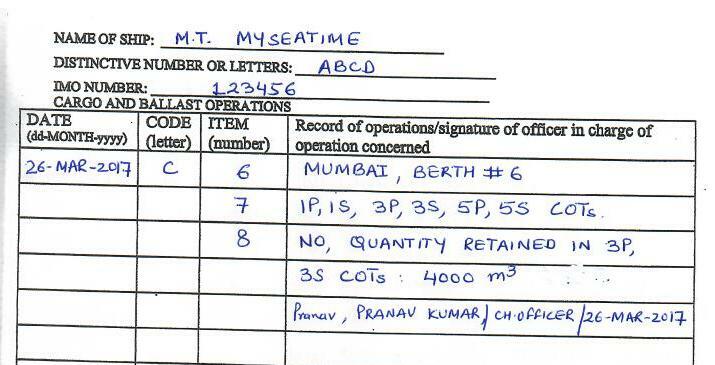 For example can you spot the error in this entry (actual entry from a ship’s Cargo record book) !! First only total quantity is mentioned and not the quantity loaded and total quantity in the tank. Second, the entry itself is ambiguous. 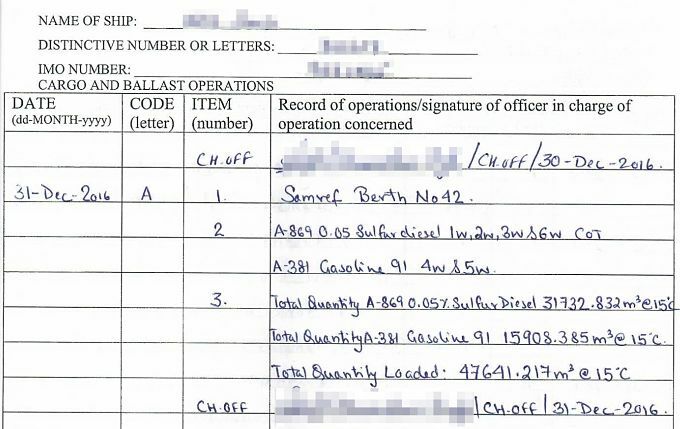 No one can tell if the “Total quantity” mentioned is the Quantity loaded” or “total content of tank”. But there is another version that I see sometimes. Recording the two quantities as “Gross volume” and “Net Volume”. See below actual example. Now there are multiple errors in recording the quantities and thus many unanswered questions. Net volume at what temperature ? Net volume & Gross volumes: Cargo loaded or total cargo ? The guidelines for filling up individual rows like A-1, A-2, A-3 remains same. But even when all the data is available, there is still one error that I see too frequently. The ideal entry in cargo record book will look like this. The idea is to make different entries for each grade even if the cargo was loaded at the same berth of the same port. I have seen sometimes we try to make a common entry for all the grades loaded at same port. The result is not so nice looking. For instance see below actual entry for loading two grades. 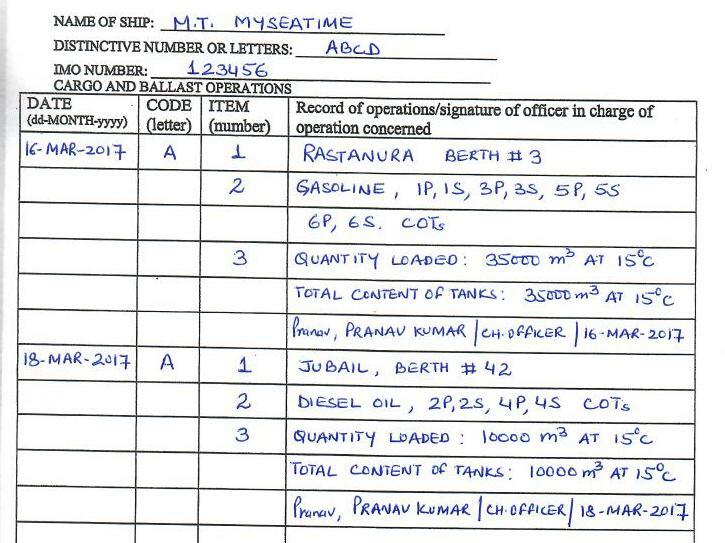 It has information about total quantity loaded but not the total content of the tanks. It is really a bad idea to try to merge both the entries in one. 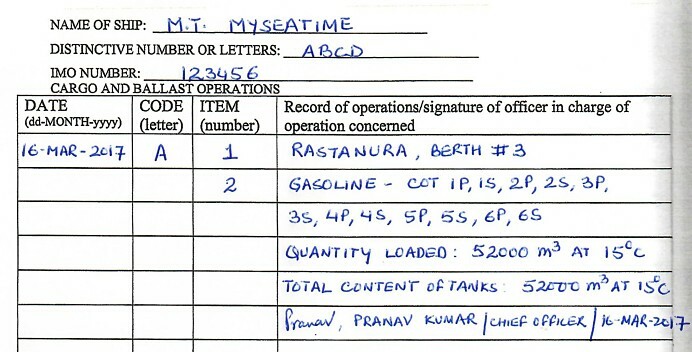 A big confusion in these type of entries is the “total content of the tanks”. Is it total content of the tanks being loaded for this cargo or total content of all the tanks of the ship ? You may not find this clarification from any of the reliable sources. But if we go by the logical thinking, it need to be the “total content of tanks loaded in cargo tanks of that particular entry”. The entry for loading at more than one port is no different than what we already discussed in condition 2. The cargo record book entry should look like this. 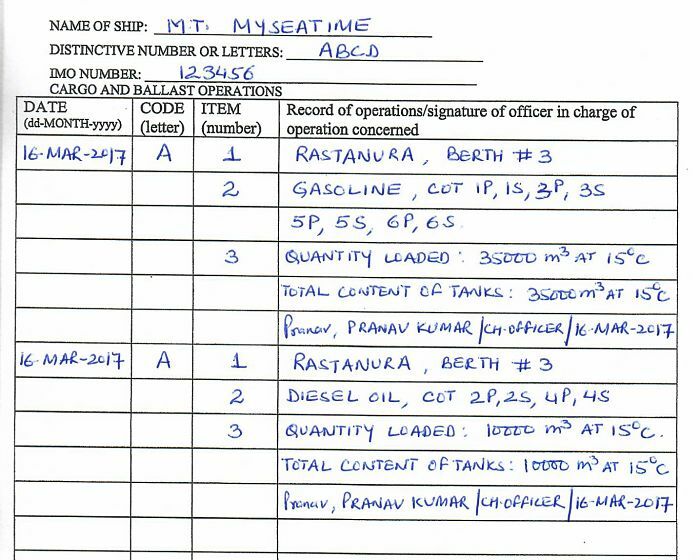 As I clarified earlier, the total content of the tanks need to be the total quantity in the tanks mentioned in that particular entry. Once we are clear on the first three conditions that we discussed, we are good to go for any other combination. For example once we are clear, it is not difficult to understand and make correct entries for “loading multiple grades in multiple ports. Let us see how we actually need to fill this data. The ideal entry would look like this. Sweet and simple, right ? For row C-8, I see sometimes we write it as “Yes, all tanks Emptied”. Nothing wrong in this but why add extra words ? I recommend to keep it simple. Just “Yes” is perfect. This again is not that complicated. By this time you already know how this entry would be ? This is little bit trickier than unloading of cargo by emptying the tanks. After unloading: 1W, 5W were emptied and 3W was part discharged. Total of 4000 m3 was the balance in 3W after unloading. For the second discharge port the entry will look like this. This is another common operation specially on product tankers. For change of grades, we sometimes need to clean the cargo tanks. Let us see an example of how each row need to be filled in cargo record book. There are few things that I must clarify in this entry. 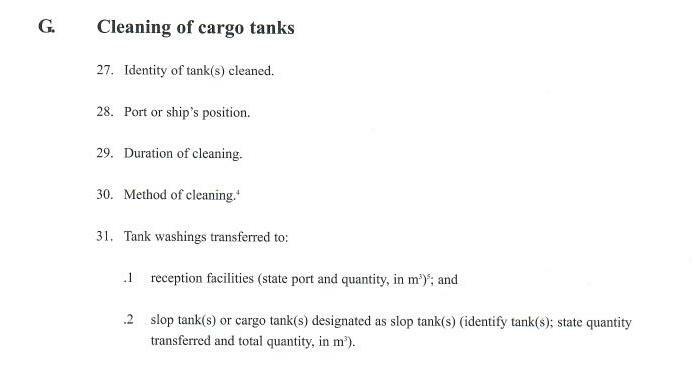 Date of entry is the date when tank cleaning operation of the mentioned cargo tanks was completed and not the start date of tank cleaning operation. Ship’s position entered in G-28 is the position where tank cleaning operation was started. 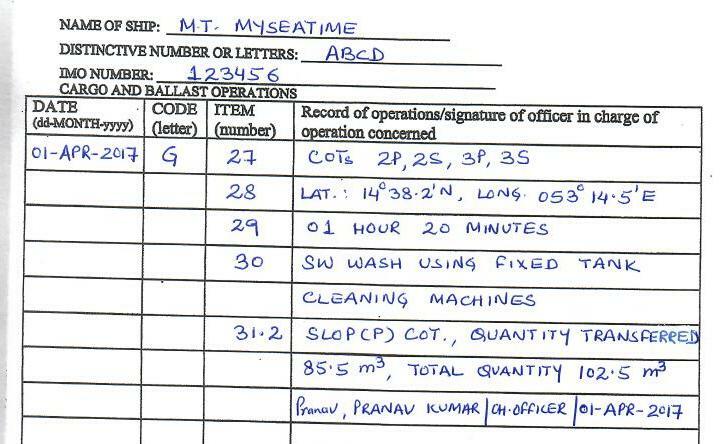 Few mates while making this entry write both Commenced tank cleaning position and completed tank cleaning position. Nothing wrong in that but it is again an extra undesired information. The reason no one is interest so much in positions and start stop time is that all the washing are required to be on board. Another thing is the duration entered in G-29 which is the total duration of cleaning of the mentioned tanks. It is good practice to make different entry if the tank cleaning was stopped for considerable period. For example let us say that on one day tanks no 1W, 2W, 3W were washed and then on the next day morning 4W and 5W were washed. In this case we should make entry of washing 1W, 2W, 3W for one day and then next day for 4W and 5W. If you still wish to make one entry only then the duration of cleaning should be calculated as the total duration for which tank cleaning machines were running. The accuracy of this information should be supported by the port log record. When we have done the tank cleaning of the tanks, we can discharge the tank washings collected in the slop tanks through ODME. To be able to do that certain condition of Marpol Annex I need to be fulfilled. But when these washings are discharged to see through the ODME, we need to make an entry in oil record book of this fact. Let us see how we need to make the entry for discharge of water to the sea. In this most of the sections are quite straight forward and do not need any explanation. But few sections may be confusing so here comes the clarification. 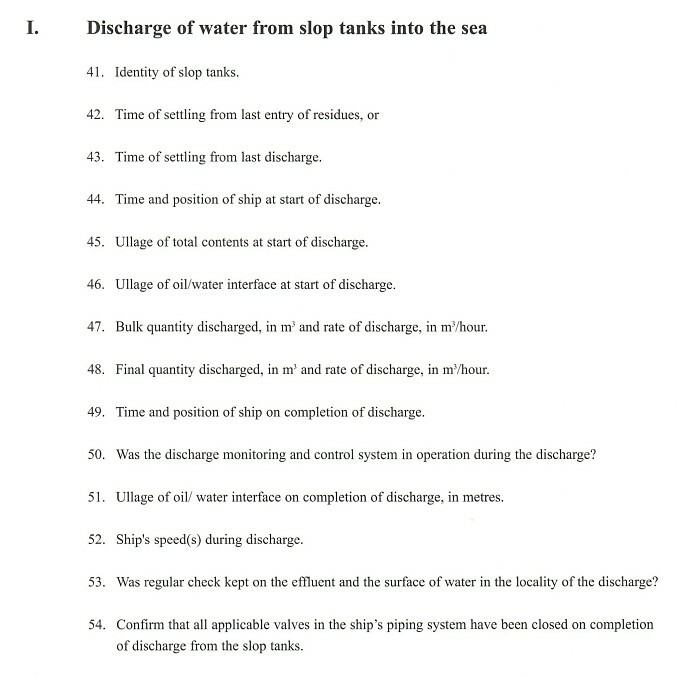 First thing need less to say that during the time between I-44 and I-49, vessel must be complying with the discharge criteria as per MARPOL annex I. For the entries, the times mentioned in I-44 and I-49 should be the ship’s local time. 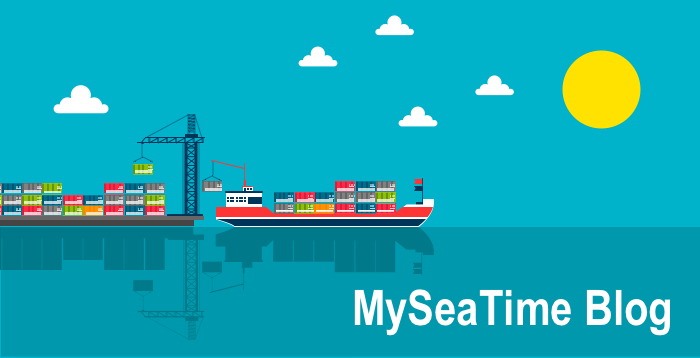 This is simply because we are writing the date as per ship’s time, so time should also be corresponding to that. If you are wondering what if there is a date change between the time as per I-44 and I-49. This can never happen because we are not supposed to discharge water to the sea during dark hours. There is sometime a huge confusion about I-47 and I-48. 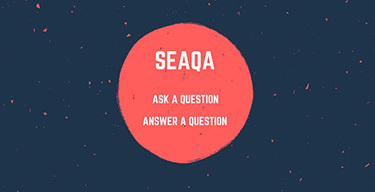 This concept assumes that the discharge of water to the sea will be in two stages. In first stage the water is pumped out through ODME with higher discharge rate. As the oil/water interface aprroaches, discharge rate is lowered to avoid the churning of the oil/water interface. Under I-47, we need to record the quantity discharged and rate achieved during first stage. Under I-48, we need to record the quantity discharged and rate achieved during second stage. There can be instance when we would stop ODME and thus discharge of water manually without reducing the discharge rate. In this case we can write “NA” under item I-48. What if you have missed an entry ? 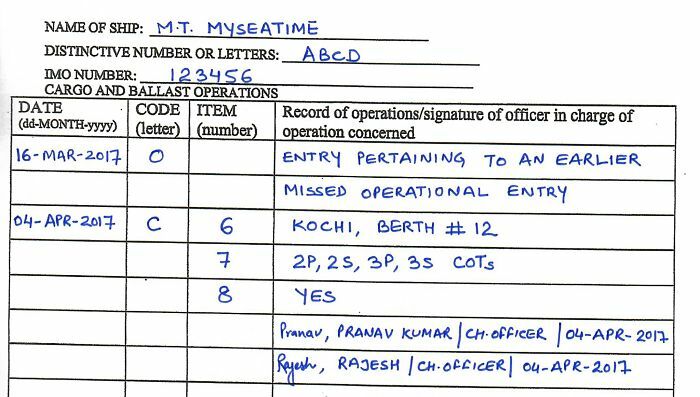 Let us say you missed to make an entry for cargo discharged at Kochi on 16th March 2017. In this case you can use code O to make that entry. So how do we do that ? Have a look at this entry. 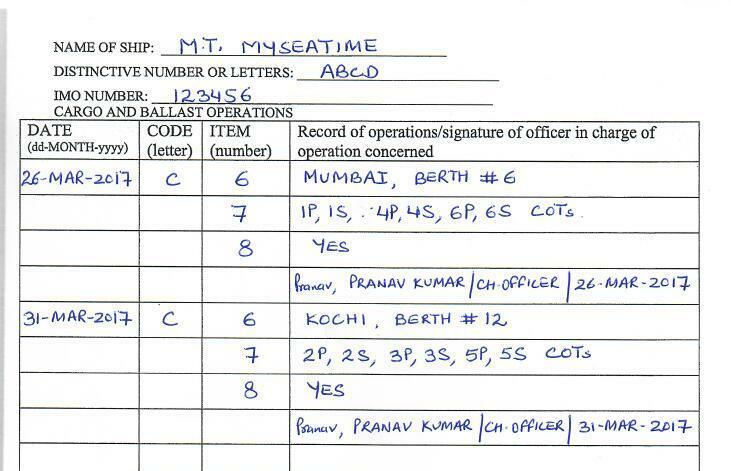 In this entry, the date corresponding to Code “O” is the date when the operation was carried out. The date corresponding to the missed entry (in this case code C) is the date when the entry is now being made in the oil record book. You would have noticed that there are two signatures at end of this entry. The first signature is for the person making “O” entry. And the second signature is for the person making the missing entry (C in this case). The person making the “O” entry could be the master. It could also be the relieving chief officer who detected the missed entry. The same chief officer should not be making both these entries, simply to have a check on such entries which are exceptional in nature. Having a way to record a missed entry does not give the license to frequently miss the entry. 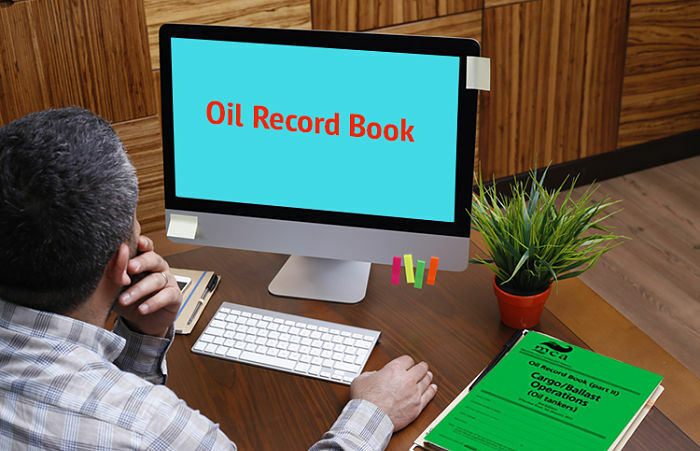 Oil record book is one of the most important document that chief officer has to maintain. False, missed or incorrect entries are considered a serious offense worldwide. This makes it so much important to have the knowledge of making the correct oil record book entries. 1st i see in last page example how to write in oil record book its showing the code written in each items number it important or no ? And here you write the retain on board for 3 w is 400 m3 without @15 c ? A.1 place of loading A.2 Cargo Name A.3 you must write cargo quantity at 15c Means Gsv And if you have already on board such cargo and you loaded again you should write total quantity in Gov also at current temperature . It is a good practice to identify how many fixed machines did you use at tanks washing and at which bar . It is bad practice used fixed machines only . Look from scanner or polar manual which type your vessel has as a cleaning machine . You can see at which bar one scanjet gives output quantity. For example used 1 scanjet machine with 8 bars . Dear Sir, Very good article. Need feedback on following scenario: After discharging Marpol Annex I - CPP/Gasoil, cargo tanks, lines, pumps cleaned with ambient water for 1 - 2 hours and transferred to Slop tank for decanting through ODME or to Slop Barge. Thereafter, after tank inspection, can I wash tanks and pump out washing water to sea directly considering the water to be Clean Water or Any washing water after Annex I / CPP to be Still retained in the Slops to decant through ODME or to Slop Barge?? If this is on Oil tanker... any water used for cleaning need to pass through ODME.. on Chemical tanker that carried oil cargo,this is a grey area because after initial washing if we are using chemicals for cleaning it cannot pas through ODME. In this case it is allowed to pump out through Annex II line provided tanks has been checked before washing with chemicals and no oil traces found. An entry with regard must be made in port log. Dear sir What about if you get some rain water on spliled box and you draining to slop tank how must be that entry made? This is a grey area but that is how chemicals tankers are operating and seem to be acceptable by various authorities. 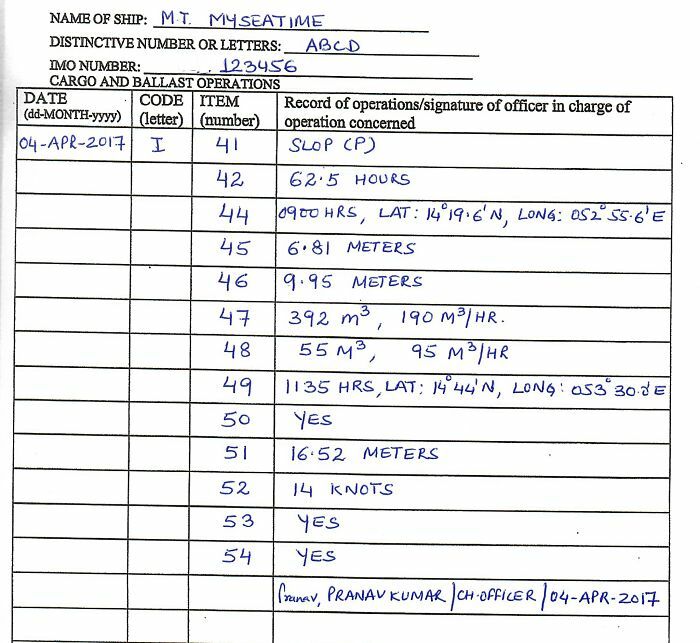 The important is to make the visual inspection of the tanks and record in port log that tanks were found to be free of any trace of oil. It can be done under code O. It can be under code O. The entry should match (quantity discharged etc) with any documents provided by the shore. That would be under code O. It can be recorded the way we want but it should match with the sample records. Dear sir. Congrats for you site and all the helpful answers. I would like to ask in case we transfer ANNEX 1 sample back to CARGO TANK with similar nature cargo, what entry we should make in ORB 2. Any example for same will be appreciated. Hi sir, pls clarify in case of crude oil loaded having free water what would be the total content of tanks.understand As it's TCV it shud be included with free water ,then if GOV is recorded the figure would change due to change in temp also orb doesnt ask for loaded temp to be recorded .but if recorded in gsv the volume of water is unaccounted properly for standard temp. Dear Cap, I would ask for next scenario. We load Anex I, Gasoline and blend with Cargo MTBE which is anex II. How to make proper writings for loading and discahrging such a cargo which is after blending become AnexI! Sir can you please clarify more on iten I-47 and I-48. a bit more.